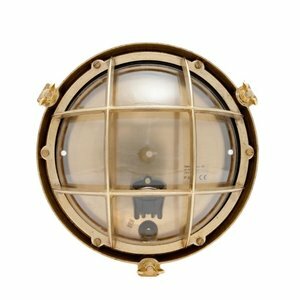 Onedin is our first marine lighting fixture which has been adapted for the land usage market without foregoing the marine feeling. The bottom plate is made of brass sheet unlike the cast brass bottom on Vinga. Onedin in brass material equipped with a clear bulb is a very decorative armature. This model is also available in chrome. Measurements: ø 245 mm. Depth 115 mm.